What are some of the most popular places to visit in South Carolina? Explore map of South Carolina; located in the southeastern region of the United States. South Carolina shares its borders with North Carolina and Georgia. The Atlantic Ocean is located to its east. It is the 40th most extensive state in the United States and covers an area of 32,020 square miles. As of 2016, the state comprised 4,961,119 people, which makes it the 23rd most populated state of the country. Columbia is the capital city of South Carolina, while Charleston is the largest city of the state. Sassafras Mountain, which is located along the South Carolina - North Carolina border in northern Pickens County, is the highest point in the state and has a height of 1,085 meters. 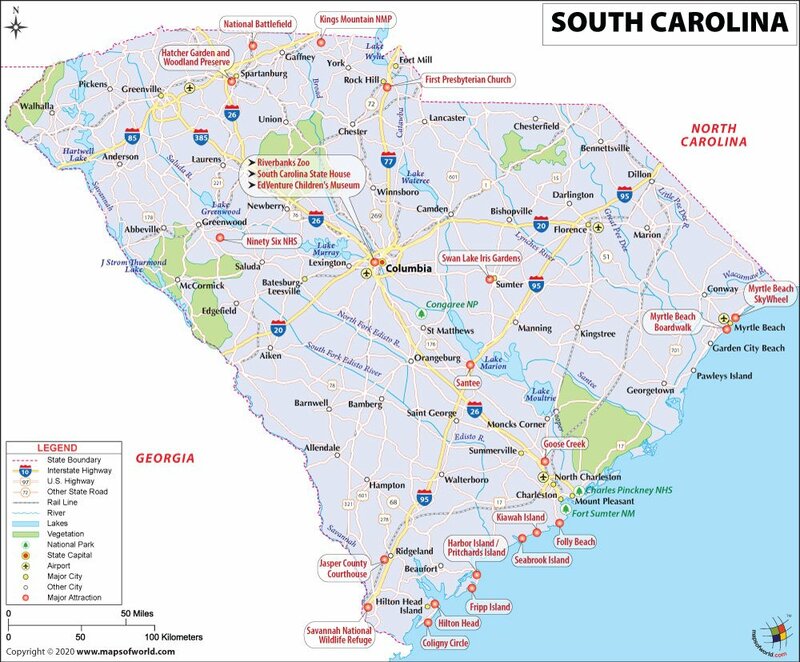 South Carolina was admitted to the Union on May 23, 1788.
: The map of South Carolina depicts the state boundary, state highways, major cities, other cities and the state capital. Rail lines, airports, rivers, lakes, national parks, and other attractions are also shown. The official flag of South Carolina was adopted on 28th January 1861. The flag has an azure background which has a white color Palmetto tree and a white Crescent. Located in the southeastern part of the United States, South Carolina is the 40th most extensive state of the country. Comprising a population of 4,896,146, as per the 2015 estimate, South Carolina is the 23rd most populous state in the United States. Columbia is the capital as well as the largest city of South Carolina. As known by its nickname of The Palmetto State, South Carolina is made up of 46 counties. Some 30 Native American tribes inhabited the region prior to the arrival of the Europeans. The first European to arrive in the region known as South Carolina was Francisco Gordillo in 1521, who came from Spain. This was followed by Spaniard Lucas Vázquez de Ayllón founding the first European settlement in the territory in 1526. In the beginning of the 17th century, England laid claim to the current South Carolina. In 1729, South Carolina and North Carolina were officially separated. The state witnessed military action during the American Revolution and adopted the Constitution of South Carolina on March 26, 1776. During the American Civil War too the state was in the spotlight and was the first to secede from the Union in 1861. Today, South Carolina is one of the most developed states of the country and has many textile and other mills. South Carolina covers an area of 32,020 square miles and shares its borders with North Carolina to the north, Georgia to the south and west and Atlantic Ocean to the east. Composed of five geographic areas, South Carolina comprises subtropical coniferous forest biome. Some of the major lakes found in the state are Lake Marion, Lake Strom Thurmond, Lake Moultrie, Lake Hartwell, Lake Murray, to name a few. With a height of 3,560 feet, Sassafras Mountain is the highest point in the state. Some of the animals native to South Carolina are bats, beavers, black bears, coyote, deer, gray fox, among others. South Carolina has a humid subtropical climate. Some famous tourist attractions in South Carolina are Myrtle Beach, Hilton Head Island, Huntington Beach State Park, South Carolina State Museum, Columbia, Riverbanks Zoo and Garden, Columbia, Caesars Head State Park, South Carolina Plantations, Dupont Planetarium, among others. Some prominent airports in the state are Columbia Metropolitan Airport, Charleston International Airport, Greenville-Spartanburg International Airport and Florence Regional Airport to name a few. Amtrak operates four passenger routes in the state. These four routes are Silver Meteor, Palmetto, Crescent,and the Silver Star. Major interstate highways are I-20, I-26, 1-77, 1-85 among others. Some reputed schools in the state are Academic Magnet High School, Palmetto Scholars Academy, Dutch Fork High School, Fort Mill High School and Spring Valley High School to name a few. South Carolina has a number of reputed universities some of which are University of South Carolina, Clemson University, College of Charleston, Anderson University, Furman University, Winthrop University, and Converse College. South Carolina was admitted to the Union on May 23rd, 1788. The town of Johnston in Edgefield County is known as the Peach Capital of the World.